Fight free radicals in the body! Act as a natural anti-oxidant! Prevent degeneration in all body cells! Give overall systemic health and support of the immune system! How has Bio-Oxidate Defence helped others? How do I use Bio-Oxidate Defence? How long does a bottle of Bio-Oxidate Defence last? In essence, the body is just the sum of all our cells! The human cell is the smallest building block. Cells make up tissues and tissues make up all our organs. Organs then work together to make up body systems. It follows therefore, that for health to flourish, cell integrity is essential. Strong cells mean strong, sound health. But there are unseen ‘enemies’ of cells. They are called oxidants or free radicals. Although their name may sound rather weird, a free radical or oxidant is produced when cells in the body burn oxygen to produce energy. As burning oxygen and creating energy is un-avoidable, we cannot avoid free radicals. They are also caused internally by normal metabolism. Free radicals are unstable because they have one or more unpaired electrons. This electron inequality causes the free radicals to attack other cells grabbing or donating the good cells electrons thereby damaging good cells. Cellular degeneration is a common pathway for ageing. The free-radical theory of ageing is that organisms age because cells accumulate free radical damage with the passage of time. Just like over time, when your car rusts due to iron exposed to oxygen, so cells age from the oxidation damage. Unfortunately, environmental factors such as pollution, sunlight, x-rays, smoking and alcohol consumption also contribute to the formation of free radicals. Furthermore, modern Western diets, and the use of recreational drugs and prescription medicines also take their toll on health at a cellular level. The body relies on every organ to function properly as they should. Cell integrity is vital for this process. When one body system is compromised a domino effect is created, with one system affecting the next. To complicate things further, as the years go by, oxidation of cells increases, leading to the symptoms of ageing. Most of us associate aging with sagging skin, wrinkles and grey hair. While these symptoms may be the most aesthetically annoying, a similar process is occurring inside the body and affecting all body systems – leading to a variety of health problems. That is why we call free radicals is the ‘bad guys’. The good news is that antioxidants are the good guys. Antioxidants are substances that combine with free radicals and prevent them from attaching to and damaging good cells in your body and for that reason, antioxidants neutralize free radicals and help to prevent cell damage and therefore slow the symptoms of aging! Some people are more easily affected by the ravages of time than others, especially if they have a genetic pre-disposition or pre-existing condition. But thankfully nature has her own defense to counter-act free radicals. Antioxidants can be found any many foods mainly vegetables and fruits. Vitamin E, Vitamin C, Vitamin A, and beta carotene are all good sources of antioxidants. These can be found in a balanced diet including walnuts, peanuts, almonds, olives avocados, fish oils, whole grains, apricots, citrus fruits, green veggies and milk. Natural remedies have been used in traditional medicine for thousands of years to support the body’s ability to promote health on a cellular level and to prevent cell damage. In more recent times, research has confirmed this traditional wisdom. There are now many published clinical studies demonstrating the ability of a range of herbs to have anti-oxidant properties. (e.g. Standley L, Winterton P, Marnewick JL, et al. “Influence of processing stages on antimutagenic and antioxidant potentials of rooibos tea”. J Agric Food Chem 2001;49:114–7). 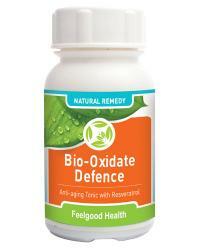 Bio-Oxidate Defence is a 100% safe, non-addictive natural herbal remedy. Especially formulated by a team of experts in the field of natural medicine, Bio-Oxidate Defence can be used consistently to safely support cell integrity. Containing a selection of herbs, high in anti-oxidant properties, the ingredients of Bio-Oxidate Defence are well-known for their supportive function in maintaining healthy cellular processes. Bio-Oxidate Defence is presented in capsule form, for hassle-free ingestion. In combination with a healthy lifestyle and diet which excludes excess sugar, stimulants, artificial preservatives and colorants, Bio-Oxidate Defence supports the body’s ability to fight harmful free radicals, thereby helping to maintain routine performance of bodily systems and encourage a slower hand of time. Bio-Oxidate Defence can make all the difference, without compromising health or risking serious side effects. This formula can be of great benefit for those who wish to discourage the ageing process and promote health at a cellular level! Grapeseed extract: Grape seeds are a potent source of proanthocyanidins, or pycnogenols containing naturally occurring proanthocyanidins, a natural powerful Antioxidant. Proanthocyanidins also have an affinity for cell membranes, providing nutritional support to reduce capillary permeability and fragility. The way in which these versatile compounds are distinct from flavonoids is their simple chemical structure, which allows them to be readily absorbed into the bloodstream. Vitamin E defends against fat-soluble oxidants, and vitamin C neutralizes water-soluble ones, but OPC’s are active against both types. (Simonetti P, Ciappellano S, Gardana C, Bramati L, Pietta P. “Procyanidins from Vitis vinifera seeds: in vivo effects on oxidative stress”. J Agric Food Chem. 2002 Oct 9;50(21):6217-21). Grapeseed extract has also been studied for its promotion of skin cell renewal. (Agarwal C, Singh RP, Dhanalakshmi S, Agarwal R. “Anti-angiogenic efficacy of grape seed extract in endothelial cells”. Oncol Rep. 2004 Mar;11(3):681-5). Grape seed extract has also been investigated for its affect on free radicals and thus its promotion of health. (Bagchi D, Bagchi M, Stohs SJ, Das DK, Ray SD, Kuszynski CA, Joshi SS, Pruess HG. “Free radicals and grape seed proanthocyanidin extract: importance in human health and disease prevention”. Toxicology. 2000 Aug 7;148(2-3):187-97). Camellia sinensis (Green tea): Camellia sinensis is the tea plant, the plant species whose leaves and leaf buds are used to produce tea. White tea, green tea, oolong and black tea are all harvested from this species, but are processed differently to attain different levels of oxidation. Green tea contains high levels of substances called catechin polyphenols, known to possess strong antioxidant, anticarcinogenic, antitumorigenic, and even antibiotic properties. (Snow JM. Camellia sinensi (L.) Kuntze (Theaceae). J Botanical Medicine. 1995;Autumn:28-32). Green tea has also been investigated for its effect on ageing skin. (Chiu AE, Chan JL, Kern DG, et al. “Double-blinded, placebo-controlled trial of green tea extracts in the clinical and histologic appearance of photoaging skin”. Dermatol Surg. 2005;31:855-860; discussion 860). Green tea extract has also been studied in recent times for its ability to help address lipid imbalances in the blood. (Maron DJ, Lu GP, Cai NS, et al. “Cholesterol-lowering effect of a theaflavin-enriched green tea extract: a randomized controlled trial”. Arch Intern Med. 2003;163:1448-53). Resveratrol: A polyphenol produced naturally by several plants when under attack by pathogens. In animal studies, anti-cancer, anti-inflammatory, blood-sugar-lowering and other beneficial cardiovascular effects of resveratrol have been reported. Resveratrol is found in the skin of red grapes and is a constituent of red wine. Resveratrol is derived primarily from Japanese knotweed. Bio-Oxidate Defence contains no gluten, artificial colours, flavours, preservatives or animal products. Adults take two capsules three times daily. Use regularly for best effect. Results may vary, due to a number of influential factors. Many individuals experience systemic support within the first week, however over time (usually 3-6 weeks) Bio-Oxidate Defence will act in a supportive capacity to cellular health and harmony. Some individuals respond sooner than others. Best results are achieved when Bio-Oxidate Defence is used consistently and the recommendations regarding diet are taken into account. Be aware that lifestyle factors such as adequate sleep and health and fitness levels will all play a part in maintaining overall health and routine vitality. Regular exercise will also contribute to good health and wellbeing in the later years. One bottle of Bio-Oxidate Defence contains 60 capsules and at full adult dosage (2 capsules three times daily) will last 10 days. A 30 day supply of 3 bottles is offered at a discount (see the 'Buy 2 Get 1 FREE' special). Hi. I have tried to lead a healthy lifestlye, but with all the pollution in the world, it sometimes feels pointless. Thank you for a product that helps to support my body against all that life throws at it! I had to write in and tell you my story. I am 63 this December. A while ago I entered our town beauty pageant under the grandmother and granddaughter division. After using your product, when I entered this year, the lady at the desk thought I was in the wrong division!! She couldn’t believe how wonderful I looked for my age. I think I have you to thank! So THANK YOU! I feel ten years younger and it’s one thing to eat right and exercise, but at least now I know I am also doing something from the inside out. Thanks for a great product, keep them coming. Timeless Beauty: Internal skin tablets plus remedy to fight aging and an all round adaptogenic!